Everywhere you go there are warnings about what smoking can do to your health. But not so many people are talking about the effect smoking has on your teeth. Let’s set the record straight. 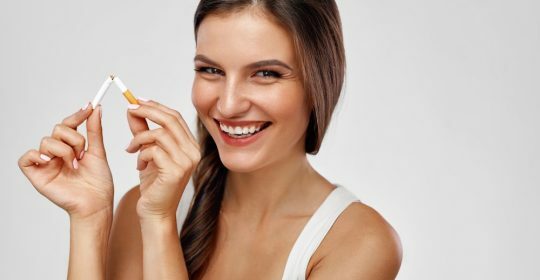 Read on to find out what tobacco is really doing to your teeth and how to talk to your dentist about a treatment plan. We’re all looking for a perfect smile and white teeth, but routine brushing is only half the solution. Brushing won’t remove staining or reduce halitosis (also known as bad breath). So what damage is smoking doing to your teeth? Smoking contributes to stained teeth, bad breath and a diminishing sense of taste. If that’s not bad enough, over time your immune system will deteriorate and it will be harder for your body to recover from illness. With constant contact with tobacco your mouth is at risk of periodontal, gum disease and oral cancer. The constant inflammation can affect the bone and other supporting structures in the mouth, leading to tooth loss. Don’t let these issues deter you from quitting. It’s never too late to quit unhealthy habits. Before you quit smoking, it’s important to consider consulting both health care and dental professionals. Commonly, patients desire to quit smoking is reduced when they see all the work and issues that come with restoration treatments. Factor in setbacks – don’t be discouraged by a setback. Plan for it and have a support network to help you through it. Anxiety can be a major factor influencing unhealthy habits. Opening up a conversation is the key to kicking a habit. An overwhelming 20% of patients with anxiety and reservations about quitting are more open to quitting even after a short conversation with their dentist. Dental health care professionals are trained with skills to help you reduce tobacco use, review your medical history and provide educational and motivational resources to support smoking cessation. If you want to quit smoking, consult your dental care professional for a treatment plan and support through the process. It’s not too late to kick unhealthy habits, Redbank Plains Dental is your local Goodna Dentist, and we’re always here to help.